OK, stop your smirking…it’s NOT what you think! We’re talking about longevity and the fact that, when it comes to your telomeres – the caps on your chromosomes – the longer the better. Some scientists think that older chromosomes with shorter telomeres may be associated with symptoms of aging such as wrinkled skin and a decline in our immune system. The telomeres, which sit on the ends of chromosomes, help protect them from damage. But every time our bodies replicate chromosomes during cell division, a portion of each telomere does not get replicated…making the telomere a bit shorter after each division. Ultimately, when a telomere gets too short, the cell can no longer regenerate itself. Scientists call that senescence. We call it old age. But it’s not all doom and gloom. Through my research, I’ve learned there are ways of keeping your telomeres nice and long. The keys are diet, exercise, antioxidants such as Vitamin C and E, and TA-65, a purified extract of the Astragalus mushroom. How do you know when your telomeres are at risk? You can actually measure their length through a simple blood sample. Then, based upon the results, you can modify your lifestyle and add certain vitamins and other medical interventions to your regimen to help slow the aging process. Though there is no fountain of youth guarantee, I do believe you can look, feel and act younger longer if you’re aware of what’s happening and modify your lifestyle accordingly. 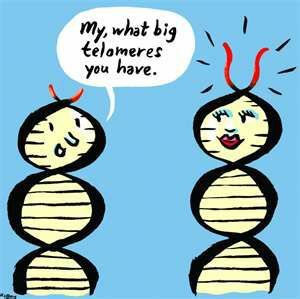 You’re only as young as…your telomeres.